How cool would it be if you could allow your online shoppers to make a real-time offer on specific products housed inside your eCommerce website? Well, with 3dcart's Make an Offer application, now you can. Here's how it works. Simply install the module, choose which products you want to include, define the minimum amount you'd accept and let your customers do the rest. 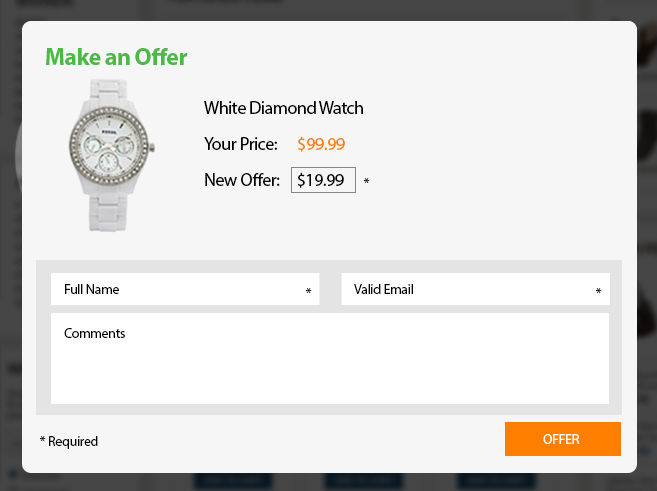 If the offer they make meets or exceeds the minimum amount defined by you, then bam, the item is sold. The best part is, after choosing which products to include and defining their base price, the Make an Offer module will automatically take care of everything else. If a customer makes a bid that falls below your pre-defined base price, they'll automatically be informed and allowed to submit another offer. Q: according to your pricing and different levels for this program. Make an offer is only available at certain price levels? A: Make-an-Offer is already included on the Plus plan or higher. Q: Does Make an Offer allow customers to offer on any quantity available or does the offer only apply to one?